In a 2011 sky survey made in near-infrared light the astronomers studying Hubble Space Telescope images spotted five clustered galaxies so distant that their light has taken 13.1 billion years to reach us. These galaxies are among the brightest galaxies at that early stage of the Universe's history. Galaxy clusters are the largest structures in the Universe, comprising hundreds to thousands of galaxies bound together by gravity. This developing cluster, or protocluster, seen as it looked 13 billion years ago, presumably has grown into one of today's massive cities of galaxies, comparable to the nearby Virgo cluster of more than 2000 galaxies. "These galaxies formed during the earliest stages of galaxy assembly, when galaxies had just started to cluster together," says the study's leader, Michele Trenti (University of Cambridge, UK and University of Colorado). "The result confirms our theoretical understanding of the buildup of galaxy clusters. And, Hubble is just powerful enough to find the first examples of them at this distance." Most galaxies in the Universe reside in groups and clusters, and astronomers have probed many of these in detail at a range of distances. But finding clusters in the early phases of construction has been challenging because they are rare and dim. "We need to look in many different areas because the odds of finding something this rare are very small," says Trenti who used Hubble's sharp-eyed Wide Field Camera 3 (WFC3) to pinpoint the clusters. "It's like playing a game of Battleship: the search is hit and miss. Typically, a region has nothing, but if we hit the right spot, we can find multiple galaxies." Because these distant, fledgling clusters are so dim, the team hunted for the systems' brightest galaxies. These brilliant galaxies act as billboards, advertising cluster construction zones. 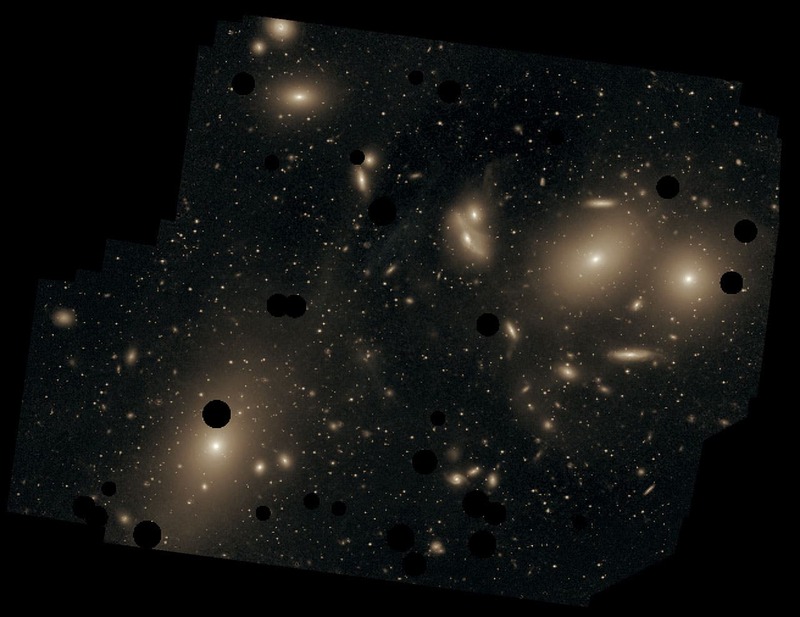 From simulations, the astronomers expect galaxies at early epochs to be clustered together. Because brightness correlates with mass, the most luminous galaxies pinpoint the location of developing clusters. These powerful light beacons are found in deep wells of dark matter, an invisible form of matter that makes up the underlying gravitational scaffolding for galaxy formation. The team expects many fainter galaxies that were not seen in these observations to inhabit the same neighborhood. The five bright galaxies spotted by Hubble are about one-half to one-tenth the size of our Milky Way, yet are comparable in brightness. The galaxies are bright and massive because they are being fed large amounts of gas through mergers with other galaxies. The team's simulations show that the galaxies will eventually merge and form the brightest central galaxy in the cluster, a giant elliptical similar to the Virgo Cluster's Messier 87 (image at top of page and immediately above). 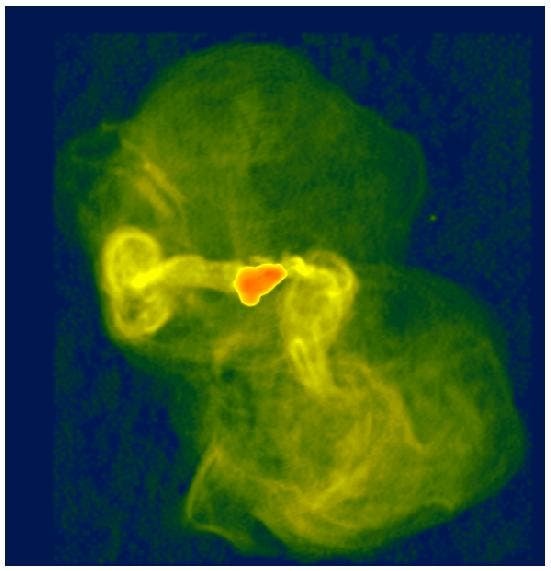 These observations demonstrate the progressive buildup of galaxies and provide further support for the hierarchical model of galaxy assembly, in which small objects accrete mass, or merge, to form bigger objects over a smooth and steady, but dramatic, process of collision and collection.The observations are part of the Brightest of Reionizing Galaxies (BoRG) survey, which uses Hubble's WFC3 to search for the brightest galaxies around 13 billion years ago, when light from the first stars burned off a fog of cold hydrogen in a process called reionisation. The team estimated the distance to the newly found galaxies based on their colors. Astronomers now plan to follow up with spectroscopic observations, which will help them precisely calculate the cluster's distance. These observations will also yield the velocities of the galaxies and show whether they are gravitationally bound to each other. The image below at left, taken in visible and near-infrared light, reveals the location of five galaxies clustered together just 600 million years after the Universe’s birth in the Big Bang. The circles pinpoint the galaxies. 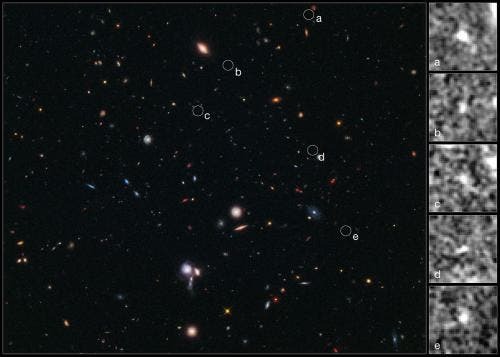 The sharp-eyed Wide Field Camera 3 aboard the NASA/ESA Hubble Space Telescope spied the galaxies in a random sky survey. The developing cluster is the most distant ever observed. The average distance between them is comparable to that of the galaxies in the Local Group, consisting of two large spiral galaxies, the Milky Way and the Andromeda Galaxy, and a few dozen small dwarf galaxies. The close-up images below at right, taken in near-infrared light, show the galaxies. Simulations show that the galaxies will eventually merge and form the brightest central galaxy in the cluster, a giant elliptical similar to the Virgo cluster’s Messier 87. Galaxy clusters are the largest structures in the Universe, comprising hundreds to thousands of galaxies bound together by gravity. The developing cluster presumably will grow into a massive galactic city, similar in size to the nearby Virgo Cluster, a collection of more than 2000 galaxies.